Please use Springfield's 311 Service Request System to report code violations. Before report ing a building, housing or zoning code violation, please check whether there is already a similar complaint open for the address. Search by address, no login required. Phone: dial 311 from any city land line, or (413) 736-3111 from cellphones or land lines outside Springfield. Online: Report online - You do not need to register to use the 311 reporting system. 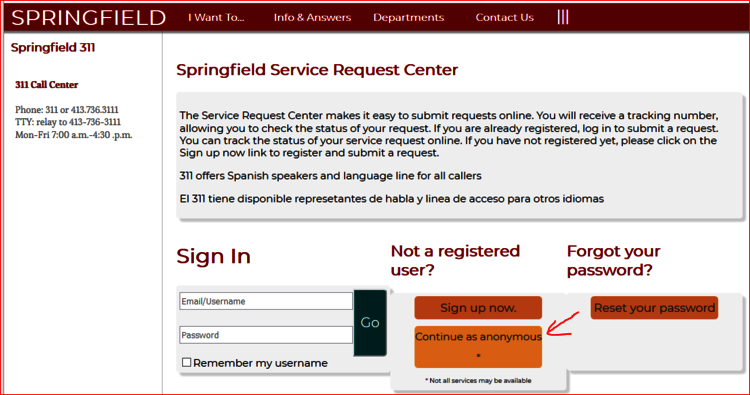 For anonymous reporting, choose the "Continue as Anonymous" buttin on the Service Request Center sign-in page.